Any of you Mamas out there deal with having this great idea, that you really REALLY want to do, but then life seems to get in the way, then of course you feel like a failure, again, and wonder why you even tried in the first place? Anyone?? I am figuring I am not the only one this has ever happened to. Well that, in a nut shell, is what happened with my blog. Memo to anyone looking at starting a blog, it may not be the best time to start a blog when you decide to purchase a house that needs as much love as the house in the 1986 Tom Hank’s movie “The Money Pit”, are pregnant with sweet baby number 8, all while preparing to graduate your firstborn from your homeschool. That my friends is a recipe for something having to go to the chopping block, and my fledgling blog was what got put on the back burner. Oh, I have thought about writing often, when I took the kids on a month long backcountry camping trip around Colorado, for practically nothing, (seriously my budget was minuscule)…I took pictures and made notes to share with my readers. I remember thinking how many of you want to take your kids on these adventures and just don’t know how to work out the logistics. I had an entire blog series planned to show you how your family could take epic family vacations, all while learning and having tons of fun. When we tore the old paneling off our home’s walls to reveal almost 100 year old shiplap while building a new bathroom, I grabbed the camera thinking I would find time to share the renovation with you. When my beloved husband had a blood pressure concern and decided to change his way of eating, I jotted down notes on recipes and tips that helped him lose 90 lbs and bring his blood pressure to a healthy level during this past year. I thought to myself after the birth of our 8th baby, how I had never experienced postpartum depression before his birth, and how I wished more people would open up about their personal experiences so maybe one person wouldn’t go through it alone. And that maybe I could have the courage to post something about my experience to potentially raise awareness and encourage just one new mama that it can get better and she isn’t alone or a bad mother. I don’t have to do this blog thing “perfect” to do it. I just have to make continual progress at it, no matter how slow it seems to me. I would encourage any of you who has felt led to do something, and wonder if it is to late, or worth the effort…begin again. I truly believe it is the Lord who has laid this desire to write, to encourage other moms, on my heart…that I am to show up and do the work and He will take it from there. He can take my imperfections and bring something beautiful from them. Will there be breaks in my posts in the future? Absolutely! My family will always take priority over any online activity. Thinking I will always post every time I want to would only set myself up to feel like I have failed, and oh how Satan wants us to feel like we have failed and can’t possibly be useful. I can however set some attainable goals for myself and give myself grace when life with a bunch of kiddos pulls me away for longer than I’d like. Oh and the things I will have to share from those adventures. 🙂 So my goal is to blog once a week. In theory my sweet supportive husband will spend some time with our blessings, while I pour a cup of tea and chat with y’all about the logistics of running a large household while homeschooling. In practice, I will probably write a paragraph and have to stop to see who is doing what to whom and why, but that my friends is life with a large family. There is never a dull moment, and we are simply blessed to be given the opportunity to raise these treasures for the Kingdom. I look forward to what our time together each week will begin to look like as I figure out the management of my time to allow for it. Our room is 12 foot wide so I wasn’t able to get a very good shot of the entire space, but these 2 pictures encompass most of the learning space. Our dining table seats 9 comfortably and is where most of the written portion of our schoolwork happens. The sofa isn’t pictured, it is opposite the table. We gather on the sofa for read aloud time and Morning Basket time. The large white space above the table is where our projector shoots the picture and we watch documentaries, educational YouTube videos and any video portion of our curriculum. Having the projector really saves on space and we don’t have to crowd around a small screen. These 3 pictures show how we organize our space in a way that is space efficient and where the children can easily find everything they need for the day. The first picture shows our shelf that houses our laser printer, laptop crate and IKEA magazine organizers that hold our curriculum. By storing the laptops vertically in the crate we save space and the wooden crate is sturdy enough to protect the computers from the Littles. The cardboard magazine files have actually held up much better than I thought they would. We have been using them daily for a year. The red rolling cart houses all our math things. The basket desk holds all our homeschool baskets that organize various things. The large square basket on the floor holds all our extra spiral and loose leaf notebooks. The small yellow crate on top of it holds the DVD’s in our history and geology curriculum. The cardboard Amazon box holds our Thinking Tree Journals that the kids will use when we are done with the ones they work in now. I buy them as they go on sale and as I earn Amazon gift cards through Ibotta and Swagbucks. The overflowing wicker basket on top of the Amazon box holds various history, science and What’s In the Bible with Buck Denver DVDs. The baskets on top of the desk I’ve taken individual pictures of to show you inside them. This bench was mine as a child and it holds lincoln logs and trains. The cute bins hold board books and various library books we use during school time. In my 1st picture I forgot to put the art carousel in the middle of the table so I added a picture of some of the kids at the table that shows it. When the children need their pencils, gel pens, glue scissors etc I put it on the table, otherwise it is placed on a high shelf where our toddler can’t reach it. She is in the color the walls, floors, herself, and her siblings stage. 🙂 The last picture is my Mom Basket. This is something wonderful I learned from Sarah Brown’s books. I have my own Thinking Tree Journal and these are the books, dvd’s, cd’s etc that I use with my journal. I hope you’ve enjoyed this little tour. It may not be magazine worthy, but it works for us. We learn all over the place: outside, on field trips, road trips etc, but this is where we do our work that requires a place to sit at a level surface and create. 🙂 I encourage you to go over to http://ihomeschoolnetwork.com/school-room-2016/ and checkout other family’s spaces and see if some of their ideas could work for your family. We have been homeschooling for 15 years, and never participated in 4H before this past spring. We are thankful that a friend of ours texted us and walked us through how to join and showed us what we already were doing while homeschooling dovetails nicely with 4H. What I wasn’t prepared for was what that would look like trying to juggle 7 children with 5 of them doing 4H projects in 3 different 4H groups. Y’all it just DIDN’T get done. Predators got all but 1 of our baby chicks, I didn’t plan well for the monthly meeting for all the kids, and had communication problems with their Shooting Sports leader. I did manage to get the oldest two to the once a month Teen Leader’s meeting…most of the time. In years past, I would have beat myself up for being a terrible mother who was failing my kids. Now I realize that adding something new to our large family routine often takes time. Add to that our special needs kiddos, who do not handle changes well, and this Momma needs to give herself some grace. However, when I saw the posts about the fair coming up and to get 4H projects ready to turn in, I was a little sad that we didn’t have anything ‘done’. It wasn’t until last night, around dinner time, that I realized there were plenty of things ‘done’ that the kids could enter into the fair. They didn’t need to be “4H” projects to be submitted, just things the kids have been doing all along. Now why did I not think of this until 3 hours before bedtime, the day before everything was due by noon! I just ended up shaking my head at myself and turned to my daughter to ask if she’d like to submit some of her photography into the fair. She about choked at the mere thought of doing so. She is so much like her Mama in so many ways. 🙂 Shy and somewhat an introvert, she hasn’t even posted her work on her Facebook for her grandparents to see. I was truly proud of her when she met me on the couch after dinner with the laptop to pick out some pictures! She picked out 3 that she liked and I asked her to do 2 more that I loved and she agreed. There was no time to go through her hundreds of pictures to pick out her “best” ones, but I really like the 5 she decided on. So early the next morning, we drug everyone out of bed to drive the 45 mintues to Sam’s to print out her pictures. The rules said the had to be matted as well, so we added a trip to Michael’s to our list. It’s no easy feat to get 6 kids to town, Sam’s, Michael’s and the fairgrounds before noon. I was so thankful that the kids really stepped up and were helpful with their younger buddies and on their best behavior! Here she is laughing at/with her Mama for documenting her 1st fair entry. 🙂 Yes, she matted them while I drove down the road to get the the fairgrounds in time. She is awesome and just rolls with whatever needs to be done. And she is still laughing. She really doesn’t see what I’m so excited about. Please let this encourage you, that even when you think you may be failing, that it really is all right. 4H will be there this coming school year and we will figure out how to make it work better for our family. Just love your family and do the best you are able to today and it will all work out just fine. We are wrapping up the lazy days of summer with plenty of trips to the swimming hole! The dogs haven’t been with us until now, and it was lots of fun watching them figure out swimming. Hazel loves to fetch her sticks in the water for hour upon hour. She never grows tired of it. The kids like to take turns on the tube and sometimes like to tow their Momma around on it. They love to skip rocks and just generally hang out and play. One of our sons found a crawdad and had to bring it home to study. Our kids bathtub became a habitat for several days, as he studied it and learned all about these creatures and their lifecycle. Everything is an educational opprotunity at this house! It’s times like these that I just want to push pause and savor these sweet moments with my kiddos. They will be gone so quickly. There is something to that saying, that the days are long, but the years are short. Our oldest is already 17 year old. I look at what a wonderful young lady she has become and I wonder where the time has gone! I hope each of you were able to spend some time together this summer, to enjoy each other and build memories together. My husband has a term for any house built before 1940 that is in obvious need of some love. It is called a “Jill House”. This is probably due to the fact that any time I see these houses I go on, and on, and on about their rich history, and how I can imagine generations growing up in them, that someones grandfather built that house, probably with his own two hands, that it just needs some love and a family with children running barefoot through it on the hardwood floors. Of course, my dear sweet husband, who CAN actually build anything with his own two hands, looks at it, nods his head in quiet exasperation at my obvious lack of understanding of how the real world of renovation works, and smiles at me. After 20 years together, he gets me. This my friends is a “Jill House”. My family frequently comments that it is quite possible that I might have been born in the wrong decade…or century. See I love old fashioned things…houses/churches/barns (OK buildings period), furniture, quilts etc etc etc. I can just see and feel the heirloom quality of these things. I can see in my head…families and generations that have passed through them. And that is really probably the heart of the matter…family. This means SO much to me. You could say that I’m old fashioned that way as well. I hold old time values and family close to my heart. Someday I will tell you the story of us, of my husband and me and how we are high school sweethearts and the story of how our large family came to be, but I digress. 🙂 This post is to let you be here from the beginning of THIS new adventure in our life. A few months back my dear husband, Cody, started talking about possibly getting into rental houses. I, having grown up with my parents owning a few rentals, wasn’t nearly as keen on the idea. Cody can fix pretty much anything and is a real people person. He can talk to anyone, anywhere, about anything. While I, I prefer to sit back and read a book. So of the two of us, he would be much more inclined to even think to do something like buy fixer uppers and become landlords. So I started looking online at houses near us for sale. Well, there isn’t many because we currently live pretty much in the middle of no where on a couple of acres in the mountains (if you can call the tall hills in Arkansas mountains, lol). We have been here 5 years, working on homesteading, raising kids and building our dream home. Well, back in May, a house come on the market 11 miles from here on the outskirts of the nearest town. It was out of our price range, but as an avid reader of http://www.oldhousedreams.com, and a lover of pretty much all pre-WWII house, it just made my heart go pitter-patter. Of course, my husband, being the practical man that he is, was not nearly as impressed. I saved the house in my zillow.com account and tried to forget about it. In June, zillow emailed me that the house had been reduced by $10,000! This definitely put it closer to the number my husband was looking for, but didn’t really get us to consider it to seriously. In July, another email showed that it had been reduced again this time by $2,000. Okay, that was enough to get this Momma to load up 7 kids, travel 11 miles and do a drive by to check out the neighborhood! Well, when I arrived at the home and looked through the windows…guys, I nearly swooned. Yes, swooned. This house had a huge porch that wrapped around 2 sides of it, unbelievable windows and soaring ceilings. The fact that the porch was rotted/falling in and some of the windows (ok…most of them) needed to be replaced didn’t give me a moments pause. Did I mention that it had a screened in Summer Kitchen off the back and it sat on 1.5 acres! I was officially in love and pretty much convinced that we NEEDED to save this house and bring it back to life so a family could enjoy it again. Now I just needed my wonderful husband and my father to come out and figure out a way to do it. My Daddy is a master electrician and any home of a certain age probably needs the electrical redone and I do believe I’ve mention I think my husband as some serious building skills. 🙂 My husband, being the saint that he can be sometimes, somehow managed to find time to call the realtor, arrange for her to unlock the house and have my father meet us there. It happens to be in a different town than either my father lives or my husband works, having family is awesome! So later, I arrive back at the house and walk in through the back door/summer kitchen. I’m seeing all the possibilities in the summer kitchen, my husband is seeing the crumbling back stairs. Now might be a good time to tell you that my family also says that I wear rose-colored glasses. Y’all, before I made it to the front of the house to unlock the door for my parents, I might have been clapping my hands and jumping up and down like a little school girl. This was MY dream house! A craftsman 4 square that had a been added on to over the years. It even had my crepe myrtle in the back yard pruned the way I like them and a huge oak tree that is just begging for some siblings to scale. Here is the coolest thing about the whole day, every person there agreed on the house’s potential. After climbing around under the house and in the attic, both Dad and my sweet hubby agreed the house was sound and could be fixed. Now here is where I tell my husband I think it would be a great idea for us to fix this house up and live here while he builds out on our land in the mountains. Props to my husband for not telling me I was a crazy woman on the spot. 🙂 We, and I use that term pretty loosely, have done an unbelievable amount of work on our homestead in the mountains these past 5 years. When we bought it, we could barely pull a vehicle onto the property. Cody literally cut the driveway out with a chainsaw and a weed trimmer. OK, pretty much everything built around here has been by the sweat of my husband’s brow. I cook (aiming for whole foods), run the household and homeschool the kids. I’m not afraid to get my hands dirty and will help anywhere he needs, but honestly my hands are normally full just trying to keep the Littles out of whatever he is working on, or from running off with various tools. 🙂 I’m sure it took a lot for him not to look at me and say not only was I crazy, but to remind me that we were here looking at this as an income revenue not as my own version of Little House on the Prairie or whatever ideas were prancing through my head at the time. Y’all, I could live a thousand lifetimes and never deserve this man. He is the single biggest blessing of my entire life! I truly can not believe he would ever be OK with moving into town. He is a country boy through and through. 🙂 Even so, here we are buying a foreclosed home to renovate and homestead at on the outskirts of a small town in Arkansas. I’m so glad to start this blog at the beginning of this particular journey. You will be with us from the start of this new adventure. We don’t have it all figured out, but we will be okay. We have been doing the thing called life together for 20 years now. We’ve had some real crazy things thrown at us along the way, and by the grace of God have always managed. We love each other, our children, our families and our Lord so everything will work out just fine. Now there will be some overwhelming moments along the way! I may wear rose-colored glasses, but I’m also a Mom of 7 kiddos and know nothing ever goes exactly the way we plan it. Nevertheless, I’m looking forward to making the house our home, planning the homestead areas such as the gardens, chickens and orchard, and homeschooling our 7 children along the way! WordPress wants me to tell you why I started this blog and what I plan to do with it. Wow, that seems so easy to do whenever you are talking to your husband and best friend about your, possibly crazy, idea to share a glimpse of your wonderful, but overwhelmingly full life, with the entire world of strangers. It seems much harder whenever you sit down at the keyboard and remember that your an incredibly shy introvert. Why did I want to start a blog and what DO I plan on doing with it?! Well, I was thinking one day that I’m getting to a stage in my life that I’m not just starting out, but actually getting probably more towards the middle of my life of raising kiddos. I have a large family, some with special needs, that I homeschool on a homestead, and that there might be some ladies out there, who are just starting down their journey, that might be looking for someone that has walked this road before them,that could possibly have some pointers that could help them avoid some of the bumps along the way. Maybe a new mom that is juggling a nursing infant and wondering when she is going to have time to shower, let alone catch up on the laundry. Maybe a mom who is considering homeschooling or is just starting out and feels like she is drowning in a sea of curriculum choices and is pretty sure she is already messing up. Maybe a mom who suspects or just received a special needs diagnoses for her child and is wondering what to do now. I don’t have all the answers and I’ve probably messed up plenty along the way, but I do have a heart for Mom’s out there who are just trying to figure out how they are suppose to “do it all”. 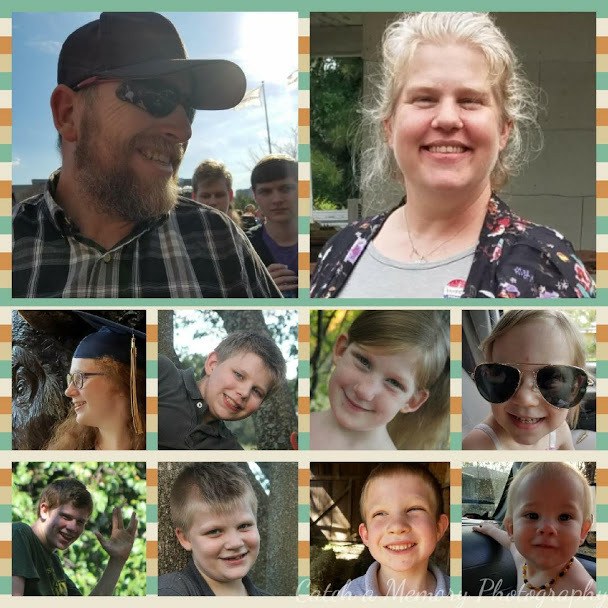 My husband and I have 7 children together and while I don’t ever “do it all”, I don’t mind sharing what I do manage to do and what is working for us and what hasn’t work out so well before. 🙂 I plan on sharing some of our daily routines, including how I manage laundry/dishes/teaching/shopping, some curriculum reviews and what has helped out our dyslexic and suspected autistic children. I hope to share how we homestead and cook with whole foods. Maybe I will work up to sharing video reviews and recipes. Now what works for us, might not work for you…by all means do WHATEVER works for YOUR family. I am just hoping to help even 1 mom out there that needs someone to tell her that she is doing an amazing job and might be looking for some tips of the trade. Thank you for being here and reading my little blog!